This decorative stair bracket is mahogany with vermillion translucent paint. Intricately carved with squash blossom, bell flower and acorn details, it became detached from the main staircase where all but two of the original mahogany brackets remain. Since their installation circa 1747, much of the vermillion paint has worn away, but enough remains to indicate the vivid color that would have coated these brackets at one time. This bracket was repaired by conservators at Colonial Williamsburg and may one day be returned to its place in the stair hall. 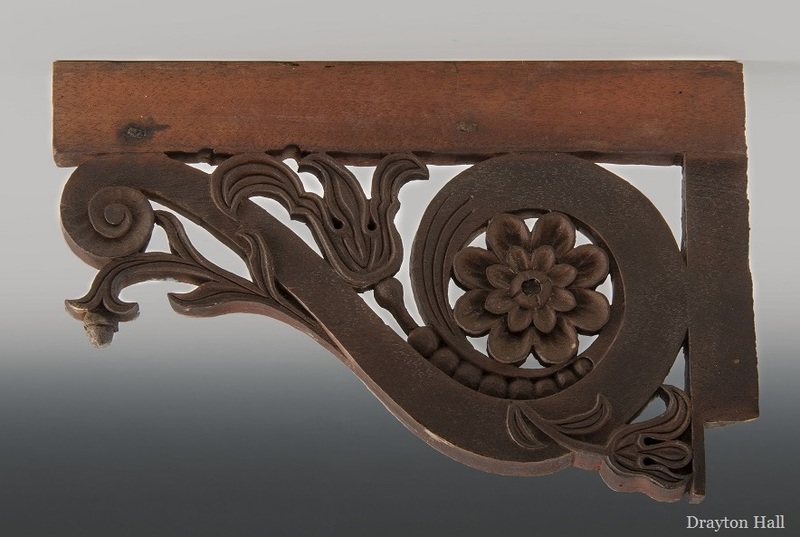 Check out the stair hall bracket and 26 other pieces from Drayton Hall at the DeWitt Wallace Decorative Arts Museum’s exhibit A Rich and Varied Culture: The Material World of the Early South. Have you seen our video that features a digital restoration of the stair hall? Click here to see what these brackets would have looked like circa 1765 with a fresh coat of vermillion paint.